The technical advances of the recent decade or so have brought about major changes in the way we work. This has brought about new challenges for Health & Safety Professionals, and this conference incorporates some of those challenges and gives us an opportunity to both question how we can best deliver our services, and also learn about some of the latest research and practice from recognized leaders and experts in their fields. • case studies showing how health, safety and wellbeing improvements have come about due to the influence of dynamic teams and proactive and forward thinking individuals within them. • latest research and practical applications. By attending, you will benefit from gaining new knowledge and experience across a range of areas that you’ll be able to apply within your workplace. This conference is open to anybody with any interest in safety, health and wellbeing, including both IOSH members and non-members. Exhibitor opportunities are available. Please email Louise Griffin, IOSH Event Co-ordinator, for more information. 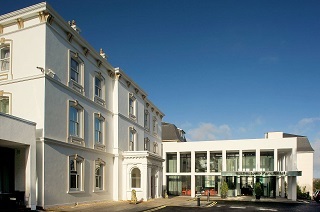 Rochestown Park Hotel is located only 5km from Cork City Centre, 4km from the Cork International Airport, 7km from Kent Railway Station and 5km from the Jack Lynch Tunnel with a public bus route also available. In addition, the hotel oﬀers complimentary a car park.